Members should have just received their copy of volume 68, on the cover is a view of St Mary’s parish church, Harrow-on-the -Hill, it is the subject of an article by Daniel Secker entitled ‘St Mary, Harrow-on-the-Hill: Lanfranc’s church and its Saxon predecessor.’ This article explains how elements of church built by Archbishop Lanfranc (1070-90), probably on the site of a pagan Saxon shrine survive within the standing fabric of the present building. The other articles in this volume are: ‘Mesolithic activity and early Neolithic earthworks at 41-42 Kew Bridge Road, Hounslow’ by Barry Bishop, Jon Cotton and Richard Humphrey. Excavations at this Thameside site revealed a small portion of a large Neolithic ditch, which may be part of a ceremonial monument. ‘Weighing up the economy of Roman London’ by Philip Smither. This is the first systematic study of three main types of weighing instruments from Roman London: equal balances, steelyards and dual balances. London is exceptional in yielding more than 134 examples of balances, a reminder that one of the great attributes of the Roman empire was a comparatively well-organised system of weights and measures. ‘Middlesex from first reference to Domesday Book’ by Pamela Taylor, traces the history of this vanished county from AD 704 until 1086. Who would have guessed it would only survive in the 21st century as a postcode? ‘The account of John of Cologne, The King’s Linen-Armourer, 1330-31 (TNA, E101/384/17)’ by Ann Causton, Edward III celebrated his successful coup in 1330, when he took over control of the government from his mother by commissioning a lot of items of soft armour to reward his supporters. ‘Excavations at St Bartholomew’s Hospital Medical College, Charterhouse Buildings, Clerkenwell Road, London’ by David Saxby, fieldwork revealed elements of the medieval Carthusian monastery and its post-Dissolution occupation. ‘An Early Post-Medieval reinforced purse lining and other finds from Finsbury Square, London EC2’ by Beth Richardson, this is a supplement to an article published in the previous volume. ‘In the path of the flames: daily life before and after the Great Fire, from excavations at 11-23 New Fetter Lane, 25 New Street Square, 11 Bartlett Court, 1 and 8-9 East Harding Street, London, EC4’ by Alison Telfer and Lyn Blackmore. This suburban area of area of the historic City of London, south of Holborn marked the western limit of the Great Fire of 1666. After the fire the area was quickly redeveloped and its previous structures abandoned. ‘A pre-fire merchant’s house in Hart Street, City of London’ by Dorian Gerhold. This 1609 timber-framed house was recorded in detail shortly before its demolition in the 1790s. ‘ “A very uncommon kind of building”: the historical development of the east wing of Somerset House, 1779-1970’ by Guy Thompson, traces the architectural and documentary history of this purpose-built government office complex. In addition, there are reviews of the 55th LAMAS (2018) spring archaeological conference and the 52nd LAMAS (2017) autumn local history conference, the theme of the latter was pastimes and entertainment in London. The reviews section discusses 20 recent publications on diverse aspects on the capital’s heritage, including the Samian cargo of the Pudding Pan Roman ship-wreck in the Thames estuary. Work is now underway on the production of volume 69, which should include articles: on the excavations within the environs of Great Barn at Harmondsworth; medieval and post-medieval discoveries at 24-26 Minories, EC1; a Bronze Age settlement at Ponders End, Enfield; the Roman painted wall plaster from 8-13 Lime Street in the City of London; Pinner’s suffragettes and the London Stone (which has just been returned to its home at 111 Cannon Street after redevelopment). Coming this April! - "London's Waterfront 1100-1666: excavations in Thames Street, London, 1974-1984". By John Schofield, Lyn Blackmore and Jacqui Pearce, with Tony Dyson. "This sounds like the book we've all been waiting for." - Christopher Catling, Contributing Editor, Current Archaeology. A much anticipated publication of four major excavations by the Museum of London - Swan Lane, Seal House, New Fresh Wharf and Billingsgate Lorry Park - will be hot of the press this April from Archaeopress and Oxbow. The book provides a synthesis for four sites with major Medieval to Post Medieval findings - laying out for the first time, the context of these finds and their deposition in groups. The book is retailing at a slightly hefty £90.00 - but what price can really be put on a relative gold mine of archaeological reading, a must have for any book shelf? Click on the image below to read the full press release, including an excerpt! The whole 514-page text will be available free for download as a PDF file from the Open Access section of the Archaeopress website. This should be in place by the beginning of May; check the Archaeopress site for release. To learn more about the publication project click here to visit the City of London Archaeological Trust's website. As LAMAS members will already be aware, the latest volume of the LAMAS Transactions (2016) features a piece by Bruce Watson and William White on the child princess, Lady Anne Mowbray, married into the House of York at the apex of the Wars of the Roses at just the age of eight, and whose skeleton was found in the '60s beneath the street of Minories in East London. The article examines past and present knowledge on the child's skeletal remains, and its findings were picked up by Times Archaeology Correspondent, Norman Hammond (published in print on November 25th 2017). Read it here on the Times Online website, or check it out below! 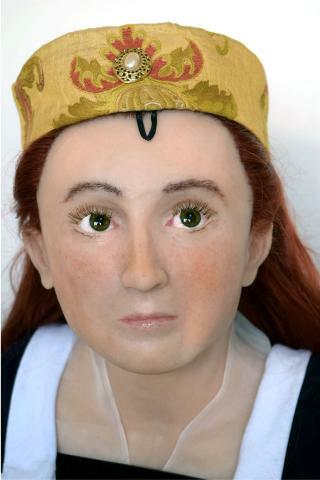 The face of a Plantagenet princess has been reconstructed from her skeleton, while her bones and hair have yielded data on her stature and health at the time of her death in 1481. The remains of Lady Anne Mowbray also have the potential to illuminate one of English history’s greatest mysteries: the fate of the Princes in the Tower. Lady Anne was the daughter of the Duke of Norfolk, his only child and, after his death in 1476, the greatest heiress in England. Edward IV got papal leave to have her married to his younger son, Richard, Duke of York, in 1478, although she was related to the Plantagenets and both were legally too young to marry. However, Anne died before her ninth birthday, leaving Richard a widower at the age of eight. Interred in Westminster Abbey, she was later ejected by Henry VII in 1502 when he built his own mortuary chapel at the eastern end. Her coffin was then reburied in St Clare’s Abbey near Aldgate, the home of her mother, the dowager duchess of Norfolk. In 1964 a digging machine uncovered her vault while clearing wartime bomb damage, as Bruce Watson reports in Transactions of the London and Middlesex Archaeological Society. Dr Francis Celoria of the London Museum (now the Museum of London) realised from the finely engraved plate on the lead coffin who was inside it and set up a multidisciplinary scientific investigation to study her remains. A fuss in parliament and in the press about the failure to obtain a burial licence curtailed the study, and its results have never been fully published. They do, however, show that she was about 4ft 4in tall — small for a modern child of nine, but the norm until the late 19th century due to deficiencies in diet. Her hair had high levels of arsenic and antimony, perhaps from her medicines, and she seems to have suffered from ill-health. When her body was prepared for burial her shroud appears to have been treated with beeswax and decorated with gold leaf or thread, and a separate cloth covered her face. “Individuals like Anne who are precisely dated are vital, so her remains are of international importance. A recent survey of more than 4,600 juvenile burials from 95 British medieval and early post-medieval sites included no named individuals”, so their precise dates of birth and death could not be ascertained, Mr Watson notes. Since Richard’s skeleton was discovered five years ago and intensively studied before his reburial in 2015, his DNA is available and a link through the male Plantagenet line could be established, Mr Watson notes. Despite many suggestions in recent decades that the putative remains of the Princes in the Tower should be subjected to the minimal sampling needed using modern technology, the authorities at Westminster Abbey (a “Royal Peculiar” outside the Church of England’s control) have resisted. “It is extremely rare for the remains of named pre-Reformation individuals to be studied in England,” Mr Watson says. Richard III’s rapid interment without perhaps even a shroud was “completely untypical and can be attributed to the unexpected manner of his death”. Anne Mowbray’s burial was that of an aristocrat with royal links and “undoubtedly of value to our understanding of death and burial during the late 15th century”. The new reconstruction shows us how her princely bridegroom may have seen her. Norman Hammond, Archaeology Correspondent. Sunday Times. Read it in the Transactions: "Anne Mowbray, Duchess of York: a 15th-century child burial from the Abbey of St Clare, of St Clare, in the London Borough of Tower Hamlets". Bruce Watson and William White. London & Middlesex Archaeological Society, Vol 67, pp. 227 - 260. Volume 67 (2016) of the LAMAS transactions has been published! All members should have now received their copy of the new volume. The cover depicts a royal wedding: the marriage of Richard of Shrewsbury, Duke of York (the younger son of Edward IV), and Lady Anne Mowbray, Duchess of Norfolk, on 15 January 1478, as imagined by James Northcote RA (1821). What made this wedding very unusual were the ages of the bride (5 years) and the groom (4). Their short lives, the burial of Anne (died 1481), plus the rediscovery of Anne’s remains in 1964 and their subsequent study are discussed at length in Anne Mowbray, Duchess of York: a 15th-century child burial from the Abbey of St Clare, in the London Borough of Tower Hamlets by Bruce Watson and the late William White. Other articles include the following: Archaeological investigations at 70 Station Road, West Drayton by Peter Boyer; A possible early Roman settlement boundary and medieval city ditch: excavations at St Bartholomew’s Hospital, London EC3 by Robin Wroe-Brown; plus another article on a different stretch of the same feature, The medieval city ditch at Bishopsgate, Heron Tower, London EC3 by David Sorapure; An archaeological investigation in the east wing of Somerset House, City of Westminster by Neil Hawkins; Part of a 13th-century barge from Leamouth and other vessels from the lower Lea Valley in the London Borough of Newham by Damian Goodburn; Fields of food for London? Supplies from the Hoo Peninsula, Kent, in the Middle Ages by Gillian Draper; Carters in the City: the operation and regulation of commercial carriage in the City of London, 1250–1550 by Claire Martin; Excavations at Finsbury Avenue Square, London EC2: from suburban medieval garden to Victorian railway station goods yard by Isca Howell; and ‘The louse, the itch, or the pox’: diseases of the prisoners in 18th-century Middlesex by Audrey Eccles. There are also illustrated summaries of the lectures given at the latest Archaeology (2017) and Local History (2016) conferences, plus a number of book reviews and a tribute to the late Ivor Noël Hume, City of London archaeologist (1950–57). It is hoped to include in LAMAS Transactions Volume 68 (2017) articles on St Mary’s church, Harrow-on-the-Hill, the archaeological evidence for the Great Fire from 11–23 New Fetter Lane, Early Neolithic activity at Kew Bridge Road, Hounslow, the historical development of the east wing of Somerset House and the account of John of Cologne, the King’s Linen-Armourer (1330).